The Alpena County Board of Commissioners met this afternoon to discuss official proceedings. 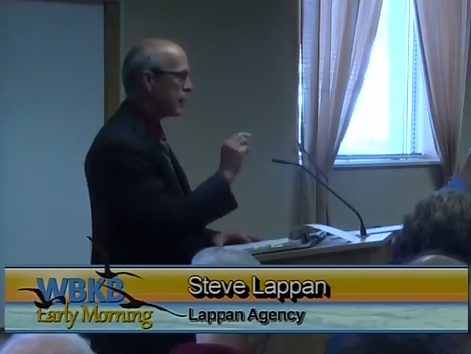 Steve Lappan, of Lappan Agency, took the stand during public comment to address concerns about the amount of time spent on recent insurance claims. According to his analysis, there were 25 percent more claims this year during roughly the same period of time last year. “And there were, there were very little exceptions in terms of time spent, days spent at the commissioner’s office and the time it got to the respective agencies. With the exception of three accounts,” Lappan stated. These claims included: the Beaver Lake loss, the Long Lake loss, and the Avery Street loss. The Beaver Lake loss is presumed to have happened in February, but was not reported until several months later, once the park had opened. Getting a hold of contractors was another issue Lappan pointed to for allegedly causing the delays. The Long Lake Park loss was the second loss, which Lappan says was processed quickly, but finding a replacement for the trailer that was destroyed during the pipe burst took longer than expected. These delays, in addition to the Avery Street loss, were allegedly responsible for the increased time spent on recent insurance claims.